Boston Police officers take a break from patroling the streets to pet K-9 Comfort Dogs.With both myself and co-founder, Melissa, living and working close to Boston, the tragedy of the Boston Marathon bombings really hit close to home. As countless news reports and first-hand accounts have shown however, out of the tragedy rose the goodness of human nature. It was as if the entire city of Boston were one big family, each person treating the person standing next to them with kindness and equality. Everyone had one mission - to see the successful capture of the second brother that was on the run. Specially-trained K9 dogs were crucial partners in the outcome of the manhunt that ended with the apprehension of suspect #2 on Friday night. Between bomb-sniffing dogs that continue to investigate whether any more devices were deployed to harm the city of Boston, and K9 tactical teams that swooped in to ensure the suspect did not escape from his hiding place, dogs were heroes too that day. This pup greeted folks at the bag pickup location following the Marathon. 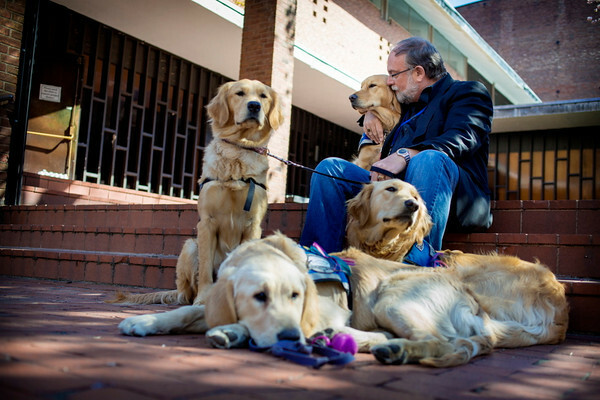 His presence eased tension and gave folks a warm, fluffy companion to help their stress.The unspeakable evil left many scars for hundreds of victims, but some very special therapy dogs are playing a major role in the healing process. 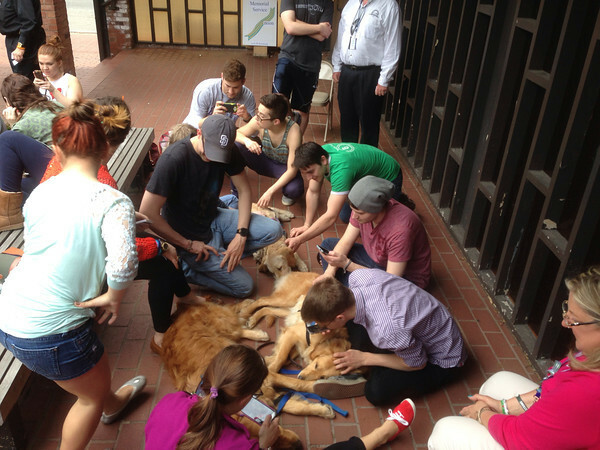 K-9 Comfort Dogs, a segment of the Lutheran Church Charities, were deployed with their dedicated handlers to Boston on Tuesday, one day after the horrific bombings, to help survivors and first responders cope with sadness and stress. These amazing dogs are trained specifically to deal with high-stress situations, with each of the organization's retrievers going through at least 8 months of training prior to being deployed. The pups have been located at the First Lutheran Church of Boston, several blocks away from the Boston Marathon finish line location, with visiting hours posted on their personal Facebook pages and here. Two of the visiting pups, Addie and Maggie, served Newtown CT following the Sandy Hook tragedy. Isaiah, Luther and Ruthie are also present. Kudos to all those who helped bring justice to the city of Boston and everyone affected by this senseless act, and to the dedicated and superbly-trained K-9 Comfort Dogs for helping bring peace to the to those affected. Every 5 years the American Veterinary Medical Association conducts a survey regarding pet ownership and related topics. 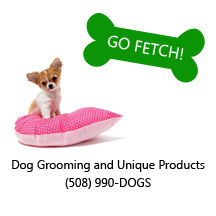 Their findings are published in their U.S. Pet Ownership and Demographics Sourcebook. I wish that the percentage of pet owners who consider their pets part of their family were higher, but I guess it's a starting point. Hopefully efforts such as the Daily Dog Blog can help make a difference in that statistic 5-years from now! I was also surprised to learn that the average veterinary expenditure per household was only $375. I suppose this could be because I know I personally spend a lot more than that per year, but then again, my dog is a diabetic and has special health needs. So I suppose the low amount could be a good indication that fortunately most pets are well-cared for and live health lives. At least I hope that's the case! Did any of these stats surprise you? Let us know in our comment section below! We wanted to share an article published in our local newspaper, The Standard Times, about our fundraiser that is coming up this weekend. So here it is! 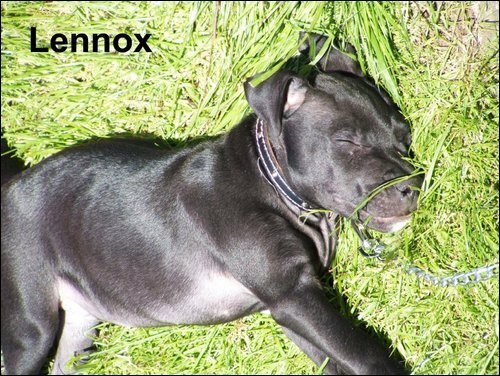 Lennox in his prison in BelfastAnyone reading this blog has probably at least heard mention of the plight of Lennox, a 7-year-old dog from Northern Ireland who was seized from his loving family two years ago as a breed banned under the UK's Dangerous Dogs Act. If this is the first you are hearing of it, you have only to do a quick Google search or look it up on Facebook to see the countless stories, articles, petitions etc. Lennox is a prime example of why I completely disagree with breed-specific legislation. This dog was living an innocent life with his family, when he got taken away and stowed in horrid conditions all because he "looked like a possible pit-bull type," per the Belfast City Council. He had never bit anymore or even snapped at anyone in the 7 years of his life. Why then did he deserve this to happen to him? How can humans, who are supposed to be the intelligent species capable of reason and logic, rationalize what they have done to this dog and to the family that loved him? Who gave us the right to determine what creature lives and which ones don't belong among us based purely upon what they look like? There's even been speculation as to whether Lennox is even truly alive. Apparently no one has actually seen the dog in months and the Belfast Council ignores requests for proof of life. From the information that is being offered, this whole case seems completely wrong to me. Personally I do not feel that the Belfast City Council has satisfied their burden of proof in showing why Lennox should be considered dangerous. So far the word is still that Lennox is scheduled to be euthanized tomorrow. The Belfast Council has also reportedly told the family that they cannot be with Lennox while they put him to sleep, and that they'd only later receive "a little of his ashes in the mail." The people responsible for this decision should truly be ashamed of themselves, and I only hope that reason wins over the Belfast City Council and that Lennox is given a chance at life. Please visit the official Save Lennox Facebook page and show your support to the family during this difficult time. There is also an official petition on his behalf on the Save Lennox website. Please join animal lovers worldwide in voicing that this is not acceptable and that change is needed! Working full-time as the head of marketing for an insurance agency, I am constantly reminding people how to prepare for severe weather, creating disaster plans, etc. But seeing this feature story on Accuweather about how animal shelters are filling to capacity following the spat of severe weather the nation has been experiencing made me realize that people also need to be reminded to include their pets in their disaster plans. Your pet is a member of your family. Please do not leave them behind should severe weather strike your community. Instead, plan ahead of time. Always make sure that your pet has some form of identification on them -- whether it be in the form of a collar with a traditional name tag (always include an updated phone number) or a microchip. Personally I would rather be safe than sorry and would have both! Should something happen to your pet's collar, you have peace of mind that your pet is still identifiable by the microchip that any shelter or veterinarian should be able to scan. Severe weather is almost always reported prior to its arrival. Talk with friends or family member who live at least 25 miles away from your community (since their home may not be affected by a storm that hits your home) and discuss possibilities for watching your pets while you sort out the details of damage done to your home, etc. Evacuation orders are possible in times of dangerous weather. Prepare ahead of time by knowing an animal-friendly home, hotel or shelter that you can travel to. Your pet is a living, breathing thing and does not belong left behind. As you can see in this Accuweather video, animal shelters quickly become overwhelmed with animals following severe storms. This puts a strain on staff, resources, and of course, the animals. Not to mention, your animal could end up in a kill shelter! And if that happens and you do not locate your pet quickly enough, how will you live with that guilt? Prepare you and your family before severe weather hits. RIP Woody : (As a lifelong resident of New Bedford, Massachusetts, I've always known the city had its rough areas just like every other city in this country. But I was appalled when I learned that on February 13th, a pedestrian out walking in the New Bedford Industrial Park area came across the bodies of two dead dogs. Those dogs turned out to be family pets that were reported missing a few weeks earlier -- a beloved Chihuahua and a Golden Retriever. Veterinarian Gerald Pietsch of the Anchor Animal Hospital in Dartmouth examined the poor animals' bodies and determined that they had both been shot "execution style," from behind. The Golden Retriever was a 12-year old family pet named Woody. Woody's owner, Eric Nelson, has told reporters that the last time he had seen his pet was on the night of January 18th, when he let Woody outside. The dog did not return as he usually did, and Nelson proceeded to hang "Missing Dog" flyers in his neighborhood and contact local animal shelters and groups. Sadly, Nelson was told by an Animal Control officer on February 13th that Woody's body was found next to the Chihuahua in the Industrial Park. Who could do such a thing? What kind of coward makes the decision to shoot two poor, innocent animals to death? And from behind? Could the monster not look into the sweet eyes of the little dogs while they shot them? And did they steal these dogs as well? The entire story makes me sick. The MSPCA is desperately seeking information that leads to the arrest of the sub-human responsible for the shooting death of these dogs. They began by offering a $1,000 reward for any information that helps their case, but due to the overwhelming support of the community and outpourings of financial assistance, that reward has been increased to $6,000. Anyone with any information related to this case is strongly urged to call the MSPCA hotline at 1-800-628-5808. Bethe Bennett of Glendale, Arizona is now recuperating in a hospital bed after falling in her home last Friday and breaking her femur. But if it weren't for her dog, Danny, she might still be lying on that floor waiting for help to come, or worse. After her brutal fall, Bethe passed out from the pain. When she woke, it was because Danny was licking her face. 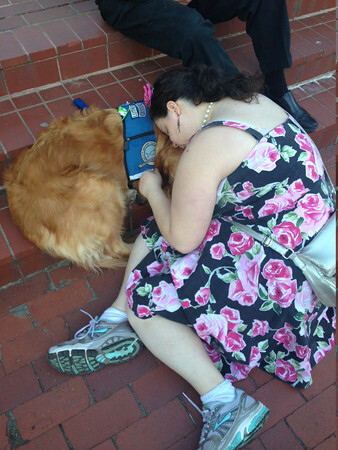 Her faithful companion, who is a trained service dog, listened while she instructed him to go get her the phone. 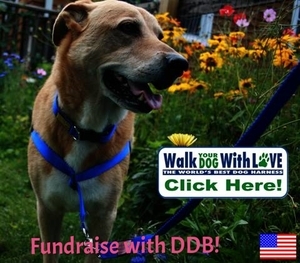 According to the report, Danny had not been an active service dog in quite some time, but Danny still figured out what his owner was asking him to do. He marched down the hall, jumped on the couch and then grabbed the phone with his teeth. 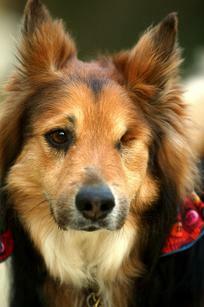 Bethe credits her dog with saving her life. The Duke and Duchess of Cambridge, or, as most people know them, Prince William and his wife Kate Middleton recently added a cocker spaniel to their family. The black Cocker Spaniel puppy is a few weeks old, according to a palace source, which the pair adopted from a close family connection. No word yet on the puppy's name, but he sure is cute! Four-year-old Lucas Hembree suffers from Sanfilippo syndrome, an inherited, metabolic disease caused by the absence or malfunctioning of an enzyme needed to break down long sugar molecules. The Hembree family was devastated to learn that their little boy would lose the ability to speak, walk and eat. The disease also causes severe neurological damage that leads to aggressive behavior, hyperactivity and seizures. Worst of all, there is currently no cure of even treatment for the disease. This poor little boy isn't expected to live past the age of 15, and doctors expect he will be in a vegetative state by the time he is just 8 years old. Realizing that every single second is important and is a cherished moment with their son, Chester and Jennifer Hembree decided to look into getting a service dog for their son. Chester was optimistic that a service dog could help keep Lucas steady as he walked and would help keep him calm when he became agitated. The father was told that it would cost at least $15,000 to get a service dog for his son and that Lucas was not "a good candidate" for a service dog because of his deteriorating health. Feeling defeated, Chester made one last effort to get a dog for Lucas and began looking into shelter dogs he thought he might be able to train. That is when he found Juno. Juno was a Belgian Malinois who was surrendered to a high-kill shelter in Tennessee because her former owner did not understand her breed and did not want the responsiblity of owning her anymore. The whole family made the 2-hour trip to meet Juno, and it was a good thing they did because Juno was just days away from being euthanized. Chester was confident that Juno would make the perfect companion for his son - especially since he had experience training the breed. Chester had trained Belgian Malinois during his work in law enforcement years earlier. Fortunately for Juno and Lucas, Juno passed all of Chester's tests with flying colors. The father needed to make sure the dog would be a suitable pet for his ailing son, so he put her on a leash to see if she pulled and she did not. Next came the Lucas test, and the pair took to each other immediately. The Hembrees brought Juno home and she took to her role as Lucas' guardian immediately. One day, Chester noticed Juno circling Lucas while he was in his wheelchair. “She was whining and nudging him with her nose,” Chester says. “I checked his oxygen levels and they were very low.” After giving him oxygen, Lucas returned to normal and Juno greeted him with licks and affection. Juno can know sense when Lucas is in trouble, saving his life on several occasions. She can sense when the child is about to have a seizure or when his oxygen levels are dangerously low. Chester Hembree set up a Facebook page in honor of Lucas and his dog Juno. Just before Christmas in 2011, there was an outpouring of support for Lucas and his amazing dog, and people all over the world were sharing their story and mailing them Christmas cards filled with words of support and kindness. The pair received more than 6,000 cards. There is something about shelter animals that make them extra special. Perhaps it's that they know they have been given a second chance at life. But whatever it is, there is no denying the benefits of adopting a shelter animal and the joy one can bring to your life. Lucas and Juno are an extraordinary example of this. Three cheers for Monty the Labradoodle! Monty is being credited for not only standing guard over his seriously injured human, Maurice Holder, 73, after the pair fell down a 40-foot ravine in England, but also for leading the shaken up man to safety. Holder was enjoying a peaceful walk along a river with his 11 year old dog, Monty, when the ground collapsed beneath them, sending the pair plummeting to the bottom of a ravine. Holder was knocked unconscious by the fall. When he awoke, his faithful companion Monty was standing nearby, carefully standing guard until his owner awoke. At this point, water from the rising river was dangerously close to Holder. The injured man was able to stand up with the support of Monty, who then lead his human back up to safety. At the top of the ravine, Holder laid down to rest and Monty took off. But he was not running away from his owner. Monty ran to a nearby pub to seek assistance for his owner! This amazing dog barked at the pub patrons until they sensed he was alerting them to some trouble and eventually followed Monty back to the site. The rescuers brought Holder to the nearby hospital where he was treated for 6 broken ribs and a concussion, but the man is beyond thankful for his loyal companion - Monty. Later, Mr. Holder told reporters for the Metro newspaper in England, "I have been back a couple of times and when I saw where it happened and how far I fell I couldn't believe it. Monty is absolutely the perfect pet. I wouldn't say he is always the best behaved but he is loyal and that is what matters – man's best friend." For more on this story, view the original article here.